Posted February 24, 2011, 6:15 PM. A storm on approach could be the coldest in at least two years in Southern California's inland valleys. 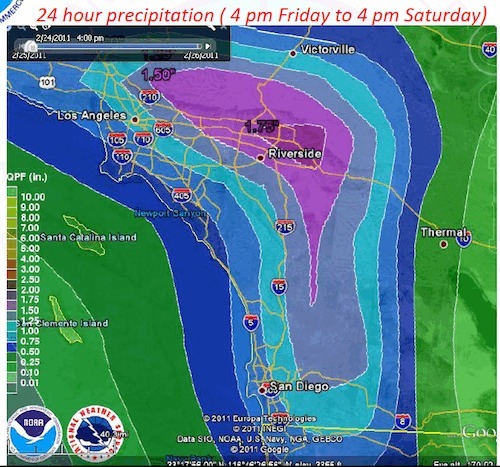 According to the latest predictions, the storm is set to deliver rainfall of between half an inch and one and half inches to Southern California's inland valleys, and perhaps the first snow in the inland valleys in two years. Chances of rain will increase during the day Friday, and rain is likely Friday night and Saturday morning, and may be heavy at times. Gusty winds will accompany the storm. The cold front will cross the region Saturday, and rain should turn to showers. 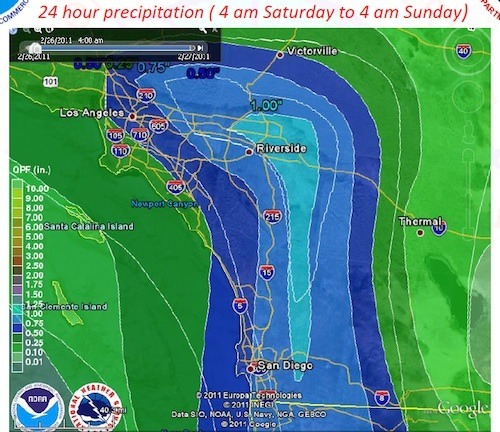 Thunderstorms are possible after the front moves on, and snow levels will fall to 1,500 to 2,000 feet Saturday night, with freezing temperatures in many inland valley locations. 1,500 feet is within range of many inland valley communities, which could see some light snow. WeatherCurrents stations above 1,500 feet include Hemet, San Jacinto, Moreno Valley, De Luz, Perris and Beaumont. Beaumont is currently the highest station in the WeatherCurrents network, and is above 2,000 feet. 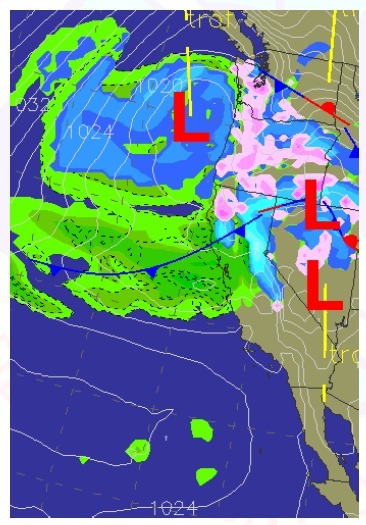 Chances are pretty good for snow in the San Gorgonio pass area on Saturday night. Fallbrook is the lowest station in the WeatherCurrents network, at about 690 feet. Daytime temperatures Saturday are predicted to be only in the 40's, and will fall into the 20's and 30's Saturday night. Frost could follow light snow as the remains of the system travel east. Temperatures were cool Thursday and skies partly cloudy as the storm traveled down the west coast, and Southern California remained in the jet stream. Beaumont and French Valley were just 54°F, De Luz, Hemet, Perris and Murrieta 55°F. Only San Bernardino even made 60°F Thursday. The last time snow levels were this low was on February 14, 2008, when some areas of Beaumont, San Jacinto, Aguanga, and the Temecula Valley Wine Country got the white stuff. Widespread but brief snowfall was last recorded in the inland valleys on January 14, 2007, when it fell in Riverside, San Bernardino, Loma Linda, Mira Loma, Perris, Lake Elsinore, Menifee, and Hemet, among other places.